Johns Manville (JM) will display a polyester spunbond for air pollution control which is produced at the new JM BiCo spunbond line in Berlin, Germany. 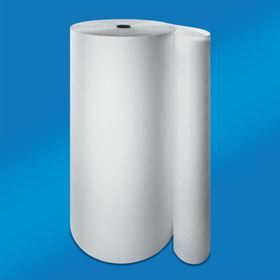 This cleanable filter media is reported to offer excellent mechanical strength and pleatability. For HVAC applications, JM provides its micro glass air media with 100% biosoluble glass fibres that are harmless to health. The natural structure of the filter media allows a low pressure drop combined with a very high dust holding capacity. It enables purely mechanical filtration. Biosoluble glass micro fibres for HEPA/ULPA and ASHRAE air filtration will also be shown. The very fine diameter of the micro fibres leads to high-filtration efficiency. The fibres are easily dispersible, providing improved density and tensile strength within filter papers. For food and beverage applications JM offers PP meltblown. The product provides precision calendaring delivering consistent filtration properties. A third party certification is available for high-purity filtration applications. Evalith™ will be the unified brand for the company's Engineered Products nonwovens business.